Garden Tips from Garden Mama! Coming This Football Season! COLLEGE FOOTBALL REWIND! The College Football Rewind is a weekly 60-minute recap show that goes into the heart of Saturdays around the country. Going beyond your typical “highlight” show, it will use the play-by-play radio broadcasts to tell the story of all the biggest games from the previous weekend. It will hit on all the games in the Top-25, while also going beyond the scope of the polls to highlight great finishes from other games, name the best performers of the week and more. Starting this football season, Sundays at 6pm on 1490 AM and 107.7 FM! Check back here for more details! Previous: Special Programming Alert! The Royal Wedding! Next: Red Carpet Bowl Time! 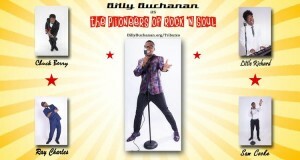 Pioneers of Rock N Soul Starring Billy Buchanan! Copyright © 2019 Vicksburg Radio. All rights reserved.